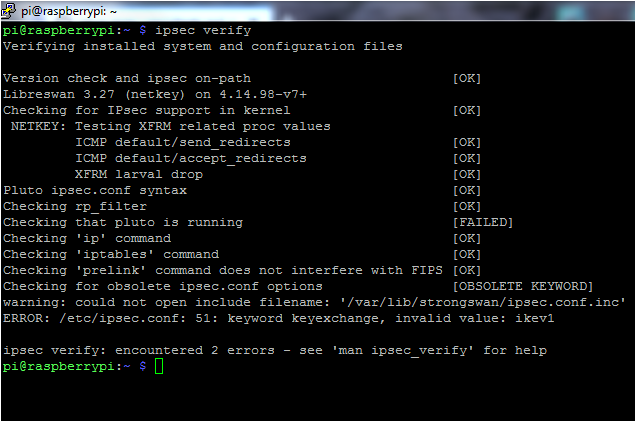 After setting up and rebooting my raspberry pi, when I run ipsec verify, I get the table status table of ipsec verify in which my pluto is not running(error 1) and there is an error of ikev1. Browse other questions tagged raspberry-pi vpn ipsec l2tp strongswan or ask your own question. Is it possible to get a username form a VPN (L2TP/IPSec) connection? configure VPN programatically using Protocol- L2TP/IPsec android open source code.